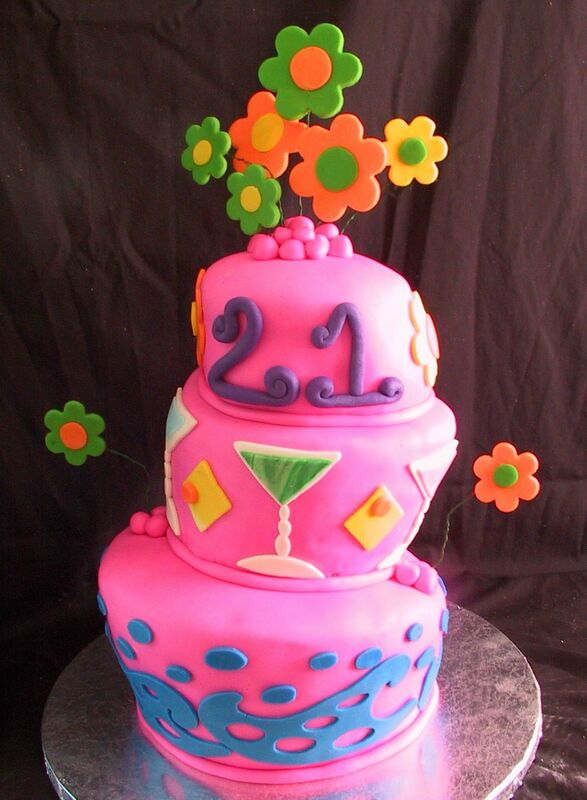 This whimiscal topsy turvy 21st birthday cake was ordered for the birthday girl by her sister as a surprise. This beautiful wedding cake with accenting cupcakes was created for an afternoon wedding that was held at the Undulata Horse Farm in Shelbyville, KY. 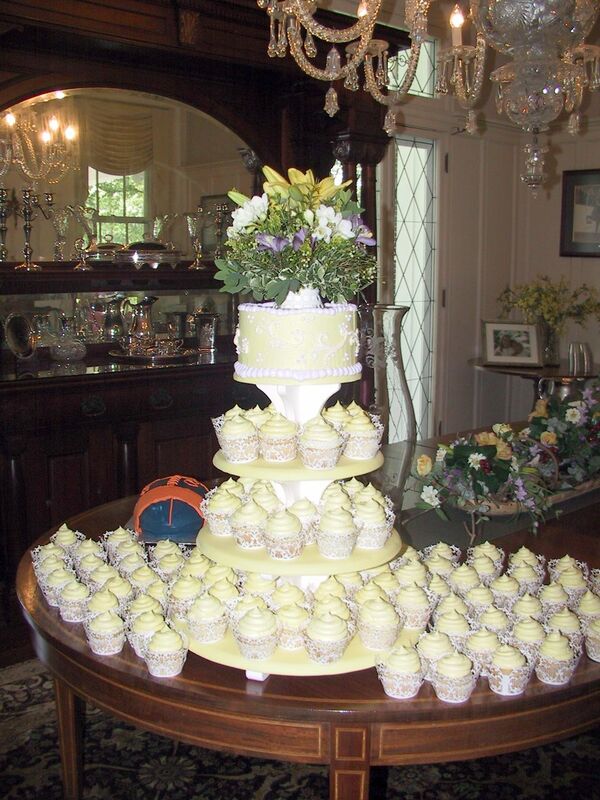 The cake and cupcakes were a white cake with a fresh lemon fillling and a fresh lemon buttercream. The cake was decorated in a soft yellow with white royal icing swirls and a lavender border. The fresh flowers on the top of the cake were white lillies, freesia and lavender austromaria. The flowers were provided by The Flower Basket in Perryville, KY.
To order your wedding cake or to schedule a consultation – call The Twisted Sifter Cake Shoppe at 859-285-0306 or email Pam@TheTwistedSifter.com. 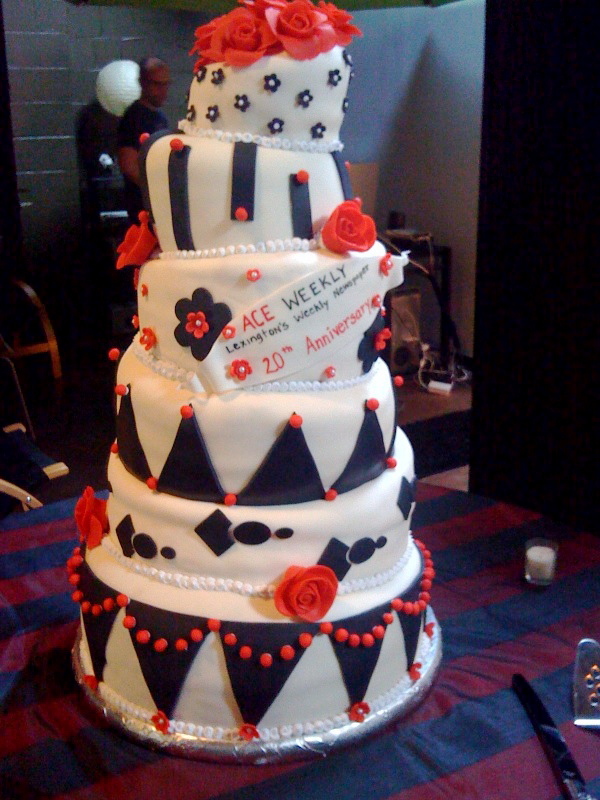 This 6 tier fondant cake was created for Ace Weekly’s 20th anniversary party. Each tier was a different flavor cake and filling. Lemon with fresh raspberry, red velvet with cream cheese, chocolate with chocolate ganache, white with fresh lemon, strawberry with fresh strawberry, yellow with chocolate buttercream. Congratulations to Ace Weekly. This eclectic cake was designed for a gentleman’s birthday and focused on his hobbies. He loves to garden, remodel and has an outhouse that he loves. So, we incorporated all of them into one cake. The cake was white with a bavarian cream filling and fresh strawberries. The icing was a vanilla buttercream. The outhouse was made out of marshmallow fondant. 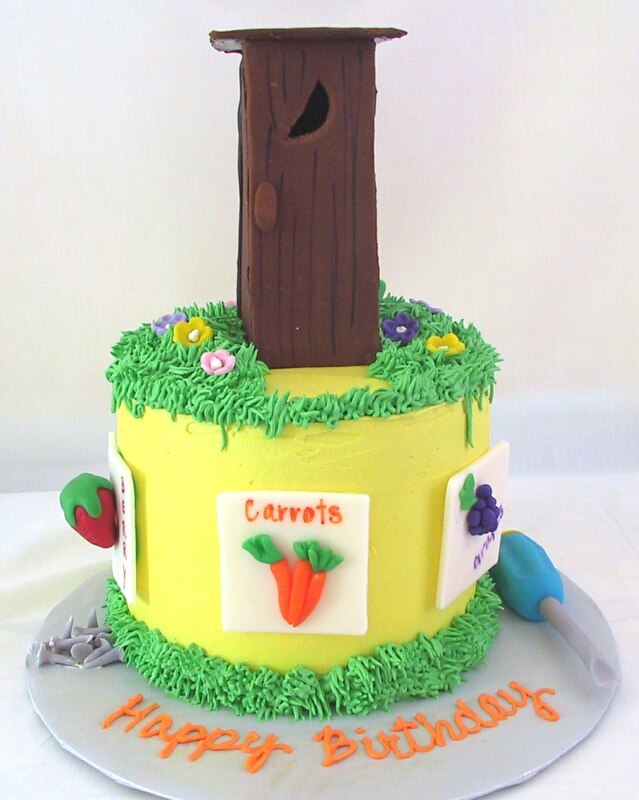 To order a cake – call The Twisted Sifter Cake Shoppe at 859-285-0306. This three tiered vanilla buttercream with black cornelli lace and fresh pink roses was for a beautiful spring wedding located at The Maple Hill Bed and Breakfast in Springfield, KY. The bride chose a white cake with a fresh lemon filling and a fresh lemon buttercream for both the top and bottom layers. The middle tier was a chocolate cake filled with a chocolate ganache. Each layer was wrapped with a 5/8″ satin ribbon. To order your dream wedding cake – call The Twisted Sifter Cake Shoppe (859) 285-0306.
) – These fresh colossal strawberries top a strawberry cupcake that has a fresh strawberry filling and iced with a cream cheese frosting. They were the perfect treat for a pool side party. To order cupcakes – call The Twisted Sifter Cake Shoppe at (859)285-0306.